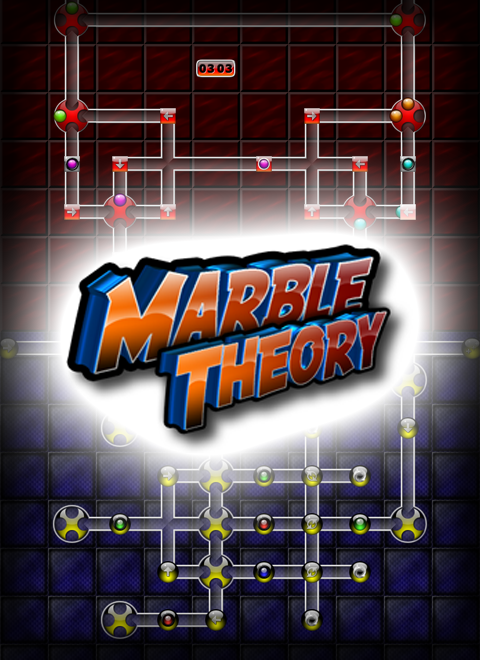 Marble Theory is a remake of an old DOS logic and puzzle games, back in the days released under the name "Logical". It is a realtime-game where from the right upper corner balls come rolled into some kind of labyrinth. Goal of the game is to mark all existing wheels. This is done by placing four balls of the same colour within a wheel to "burn" it. The wheels can be turned and balls can be kicked out of the wheels to progress deeper into the level. All wheels have to be done within a specific time-limit and there is also a time-limit for having a ball pending in the top tube. Special addons are placed within various tubes to affect the gameplay and control or behaviour of balls. There are reflectors, teleporters, trashcans, colour-changers, color-filters, slots which delay balls and other similar elements. To promote Marble Theory and grow its popularity (top games), use the embed code provided on your homepage, blog, forums and elsewhere you desire. Or try our widget. This is the English version of Marble Theory, the full release version of the game. Askutron is a trivia game for up to 8 players that can be played with gamepads and/or mobile devices featuring fully voiced questions. Bubble Buster is best described as a time waster. The whole point of the game is to pop bubbles and score points.